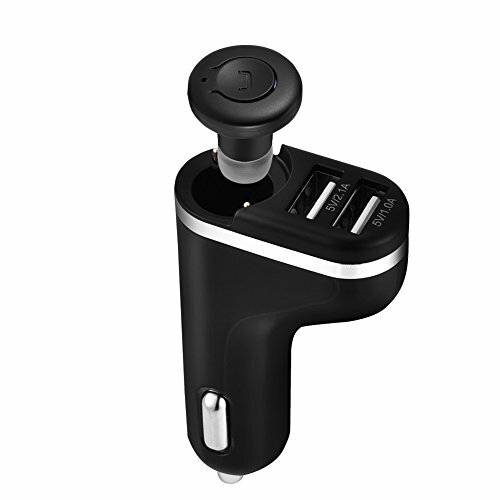 This mini usb car charger bluetooth with inserted-in car make headset charge anytime anytime when driving. Not only with smart clear voice and stable connection, but also one with two phones. Voice guidance and hands-free calls, make you enjoy yourself, free your hands. It is compact and portable, do not take up your space. Really ideal for driver. Safe Driving, built-in Bluetooth 4.2 makes transferring data smooth and stable, supports clear calling accessible to 30 feet away. Voice guidance and hands-free calls, make you enjoy yourself, free your hands. Small size and ergonomic design with soft ear buds make it easy and comfortable to wear. Connect with two phones automatically, without additional operation. More efficient.